Al Arabi opened win count at the Arab Club Championship. 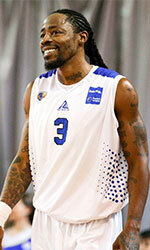 They defeated Al Nasr behind 25 points from Dalan Ancrum (198-G/F-96, college: W.Illinois). Al Arabi jumped to a 29:12 lead after ten minutes. Al Nasr pulled within 14 points at the interval. But Al Arabi used a massive 23:13 run in the third term to open a comfortable 24-point lead. The Qatari team never looked back afterwards cruising to the victory. Logombo had 15 points for the winning side. Wayne Arnold (198-F/G-84, college: Tennessee St.) answered with 17 points for Al Nasr.